Many of you will have heard the story of the Tortoise and the Hare. If not, it's one of those ancient tales that has a moral at the end of it: you know, the stories from which you're meant to learn something. In this case, the relevant lesson is the well-known phrase "slow and steady wins the race." Or, in the original (should your browser be so equipped) "Ὅτι πολλαὶ φύσεις ἀνθρώπων εὐφυεῖς εἰσιν, ἀλλ' ἐκ τῆς ῥᾳθυμίας ἀπώλοντο, ἐκ δὲ νήψεως καὶ σπουδῆς καὶ μακροθυμίας τινὲς καὶ φύσεως ἀργῆς περιεγένοντο." And with that, I succeed in applying my years of studying ancient Greek! Doctor Fletcher would be so proud. Slow and steady is the mantra for the Glen Parker experiment. I notice a difference in the 1.5 weeks it's been in the cask, but the changes are subtle. Much more subtle than those in the McClelland's in its first week, or in the Whisky Works. And to prove it, I'll do something I haven't done in what seems like ages. I'll show you a picture. Do you see it? Can you guess which is the one from the cask and which the bit I left in the bottle? If you can't figure it out, the casked one is on the left, the uncasked on the right. It is very slightly darker than the uncasked version, but the difference is very, very slight. 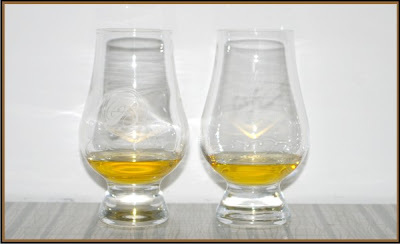 Observant readers might notice something else: the presence of not one, but two proper whisky glasses. The Spirit of Toronto show included one with the price of admission, and it conveniently matches the one given to me by Premium Bottlers, so I can finally at least pretend to be classy and show y'all whisky in its natural habitat rather than funky-shaped juice glasses. On the nose, the difference is immediately apparent, yet not shocking. The first difference is that the tar and rubber have reduced. They're still there, but not nearly as overpoweringly so. The grainy hay is still present in all its glory. Added to the nose is a layer of smoke which hasn't integrated, but has definitely done some good nonetheless. There's also the faintest hint of a sweet fruit. Strawberry? Maybe: it's pretty indistinct, and will hopefully become more evident as we continue. It's only very slightly buttery. The fishiness is still present on the tongue, but it's not in the same place. It starts with a pungent piney, oaky tang with a hint of fruit but not nearly enough, then as it begins to fade, fish and seaweed rear their heads just as the finish begins, leaving the whole affair rather sour and pungent. That's actually the perfect word for it: pungent. It puckers the lips and makes me want to have a drink of water to wash out the taste. Sound bad? It is. But it is an improvement over last week. Buried way down in there is the oak which works, but not in combination with the resinous pine and the fishy seaweed. I'm still looking for vanilla, smoke or the other flavours one would normally like to find, but I'm struggling. I keep thinking I catch them, but they're gone as quickly and as impossible to relocate as Keyser Söze. Oh, well. I'll keep looking next week. Anyhow, I need to go reward myself with a dram of something tastier. I decided to turn my whisky weekend in Toronto into a slightly longer affair, and have still not made it back to Ottawa, so no news on the Glen Parker front for another couple of days. But I thought I'd take a break from the gigantic pile of manuscripts and architectural plans staring at me and share my impressions of the Spirit of Toronto show. I went with my friend Rob who has appeared in this blog a time or two. Neither of us was entirely sure what to expect, but we were both impressed. I'll put Rob's comments up shortly as well as my own. The show was very well laid out and organized. I found I never had to wait to sample something, and the folks at the booths and the snack bar were all friendly. The food (crackers and various fancy cheeses, figs, grapes, noodley Asian things and a beef dish I didn't try) was excellent and made a perfect complement to the whisky. The availability of food and lots of water is commendable: I saw no one rowdy or obviously too much in his cups, thanks in part to the food and non-alcoholic drink. They had set up Smokehead right beside The Peat Monster. I'd not tried either, but I understand they're aimed at the same market: young-ish men who like strongly flavoured, smokey and peaty whiskies. I sampled them both, and the Peat Monster was head and shoulders above the competition: a more complex array of tastes with (of course) lots of peat, but a nice lemon and salt and vanilla undertone. Smokehead seemed simpler and so smokey that other flavours were lost. It's also about $10 cheaper, so you get what you pay for. There were three Japanese whiskies from two distillers: one Yoichi and two Yamazakis. The former was all right, but I found it was too strong in the malt and grain departments and lacked enough peat or smoke. It tasted young, though I'm not sure exactly how old it was. The Yamazakis were very clearly in the style of Scotch. If I hadn't been told they were from Japan, I'd have guessed they were from the British Isles. I'd be happy to have either the 18 or the 12 in my collection, but the price tag is a bit steep. I, in spite of my reservations, sampled both Maker's Mark and Woodford Reserve: American whiskies. The staff at the Maker's Mark booth was insane. I'm glad that they brought their enthusiasm, but I found it over the top. And providing a selection of drinks blended from their whisky was an interesting, though ultimately unsatisfying experience. When I'm in the mood for a whisky, I want whisky. Not something with mint and sugar syrup. In any case, neither of the American spirits grabbed my attention, and I'll continue to dodge bourbons and their ilk for the time being. I sampled two Isle of Juras: Superstition (a blend of a few different years ranging from about 14 to 21) and the 16. I was impressed at how different they were. Superstition was very rich and smokey and salty, while the 16 was replete with hints of oak and pine and citrus and heather. I liked them both well enough. I tried a few Glenmorangies. This is a whisky Rob says is kind of his default: if you're not sure what to get, this one will do nicely. And it did. All three that I tried were tasty, though none will be my favourite, and if I'm going to buy a whisky at that price, there are more interesting options. The Talisker 18 was already gone by the time I reached that table, which is really too bad. But I tried a Cragganmore and Dalwhinnie, neither of which I'd had, believe it or not. Enjoyable, but neither leapt out at me. I couldn't pass up the Lagavulin 16 and it was every bit as awe-inspiring as I remember. If you're wondering why I called this post "Good Things Come In Pairs" it has to do, in part, with meeting the guys who run Premium Bottlers. I knew they were both named Barry beforehand, so wasn't surprised. But over the course of the evening, I was introduced to 4 other people. Two were named Andrew. Two were named Paul. I'm no statistician, but I found that meeting 6 people with three names between them was a bit odd, but hey. Odd is what I do. Anyhow, this post is far too long, so I'll sign off for now. For those of you around Toronto next May, do yourselves a favour and check out the show. You won't be disappointed. You might remember that about a week ago I announced that the McClelland's Islay I'd been maturing was good enough for me to call it finished. And if everything had gone to plan, I'd have de-casked the McClelland's earlier this week, and been enjoying it since. But, as will not surprise anyone who knows me at all, I didn't quite manage to get that job done until today. Oh, well. The extra week hasn't hurt it at all. Quite the opposite, actually. 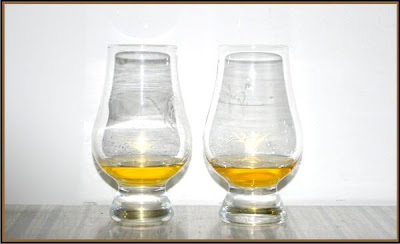 Last time, I'd noted that I found a surprising change in the nose and palate of the whisky. It had become much smokier than the preceding weeks. The floral notes were still there, but the smoke that had been very subtle at the outset had really leapt out and overtaken the other components. I wasn't complaining: it worked pretty darned well. This week, the nose has retained its smokiness, but there's a stronger biscuity smell to it as well. It's kind of like an oatmeal pancake with a jasmine tea in front of a bouquet of flowers and a wood fire with someone smoking a cigar a few metres away. The barn-yardish pungency in the original has entirely disappeared, and I'm happy beyond words to say that. It was pretty harsh before. It's quite a mellow dram. The smoke is as apparent in the taste as in the scent. The flowers are still there, as is the biscuit, but the oak is stronger on the tongue than in the nose. The finish is moderately long and quite oaky, but the traces of concord grapes have disappeared. There's just the faintest tiny hint of vanilla buried very deeply in there, barely noticeable. It's a light body, much lighter than Whisky Works. In re-reading last week's post, I had noticed the spiciness was calming down. That's still very true: it's got an element of cinnamon and cloves, but it's a lot fainter than it had been. It doesn't manage to overpower the other components of the flavour, so it has worked out rather well. All in all, I'm really happy with what the cask has managed to do to the McClelland's. It's a damned cheap whisky, but a month in the cask definitely makes it taste like a much pricier beverage.